Sixteen weeks for a delivery. It could have been here sooner, but a shipping mishap meant Kyle’s order for a new exhaust was put on hold until another unit could be built. 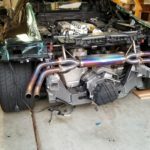 Unlike most cars, Audi R8 exhausts aren’t usually stock piled in a JEGS warehouse with free overnight shipping. 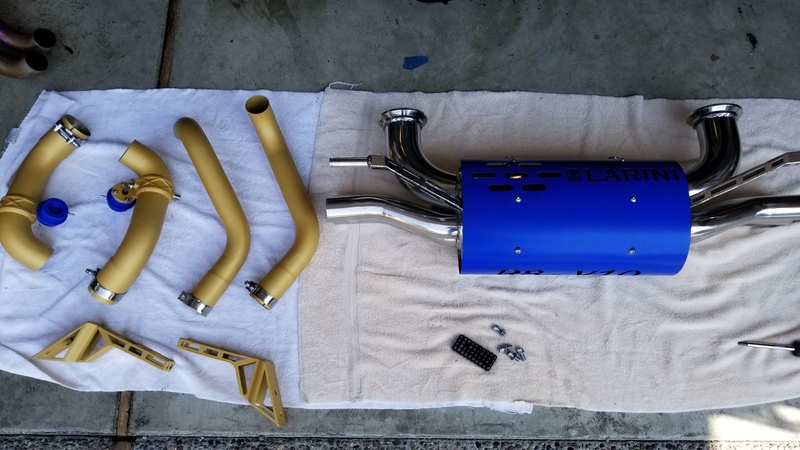 So when Kyle received the tracking notification that his Larini Club Sport exhaust had made it stateside, it was time to hustle and get the car prepped and ready for installation. 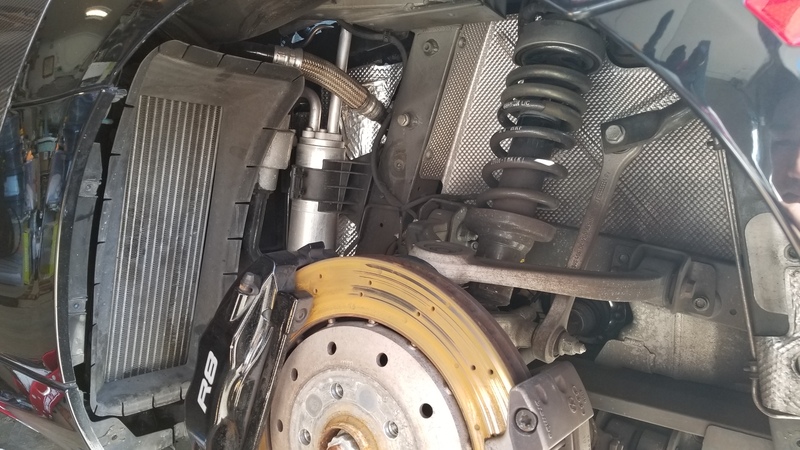 Kyle’s R8 had already been equipped with a QuickSilver exhaust by a previous owner, but you could also hear his car at least a mile away. That’s not to say it didn’t sound good, but not everyone is a proponent of the volume permanently cranked to 11. The new Larini system on the other hand is valved, so it’ll keep quiet most of the time, yet plenty capable of making the V10 scream once you give it the signal. 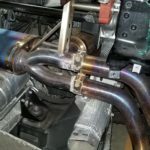 Installing an exhaust is typically a straight forward process. 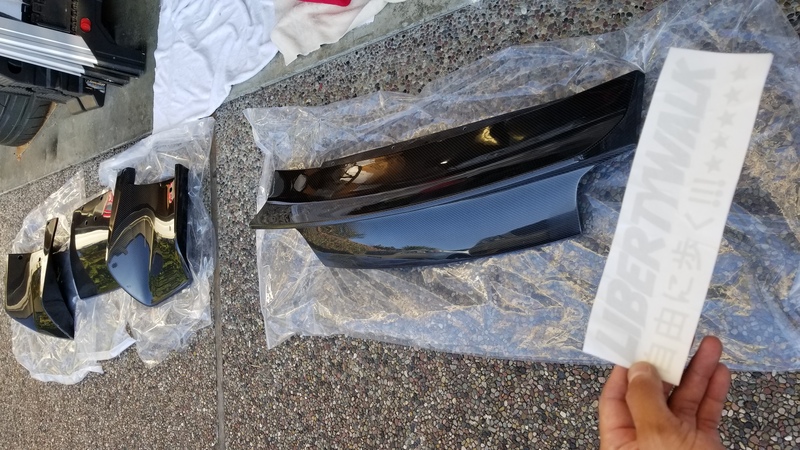 If your name is Joey, chances are you find them on Craigslist or local message board classifieds, and you spend an hour after work getting it installed. It’s a straight forward affair. 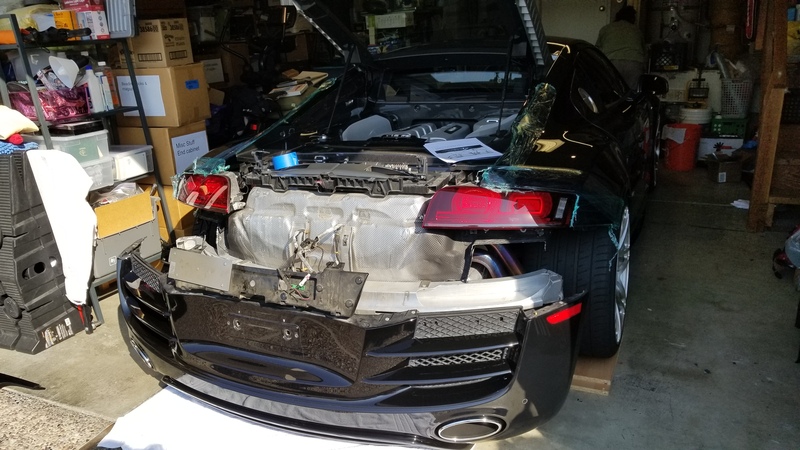 The exhaust on the R8 is a different animal though, as the rear of the car has to be peeled away to gain access to the “muffler.” Kyle got a head start by removing the bumper shell and fender liners, so by the time I showed up, the chaos of Torx screws was set in motion. 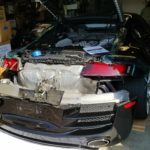 The taillights were next, and the lighting wiring harness was carefully moved from harm’s way. With the rear wheels off and car on stands, the fender liners have to come to begin gaining access. Torx bolts and more torx bolts to get the bumper shell off and expose the massive heat shielding. Here’s what the exhaust system looks like without all the heat shielding in the way. Check out the dry sump unit to the left of the transaxle. 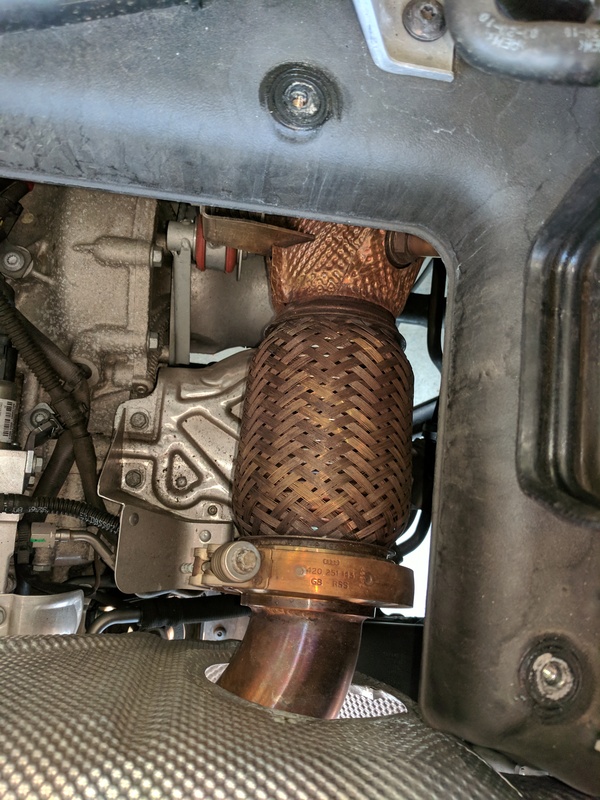 The Audi’s exhaust routing isn’t terribly complicated, as the headers/cats feed right into it, but the extent of the heat shielding looked like it wasn’t so much for keeping the engine cool, but rather atmospheric reentry. I guess the Audi does look a bit like a spaceship. 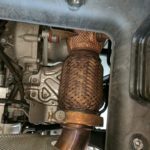 Either way, the heat shielding encases the muffler, so one can’t be removed without the other. 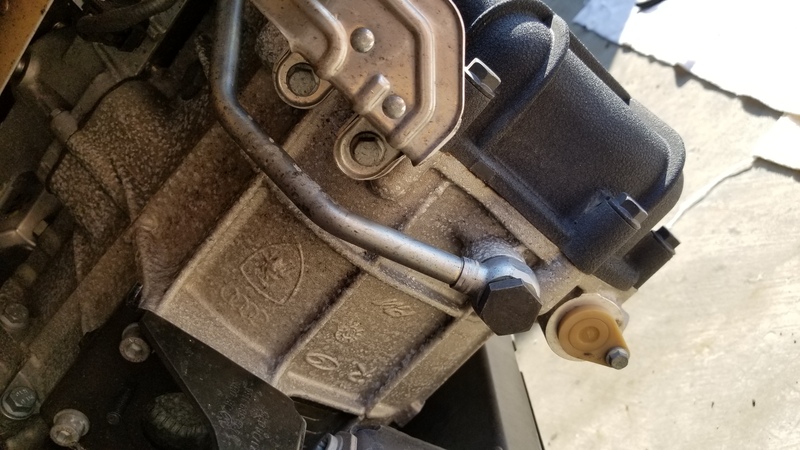 Using a guide Kyle found online, it was strongly suggest that the muffler be disconnected from the headers before undoing anything else. 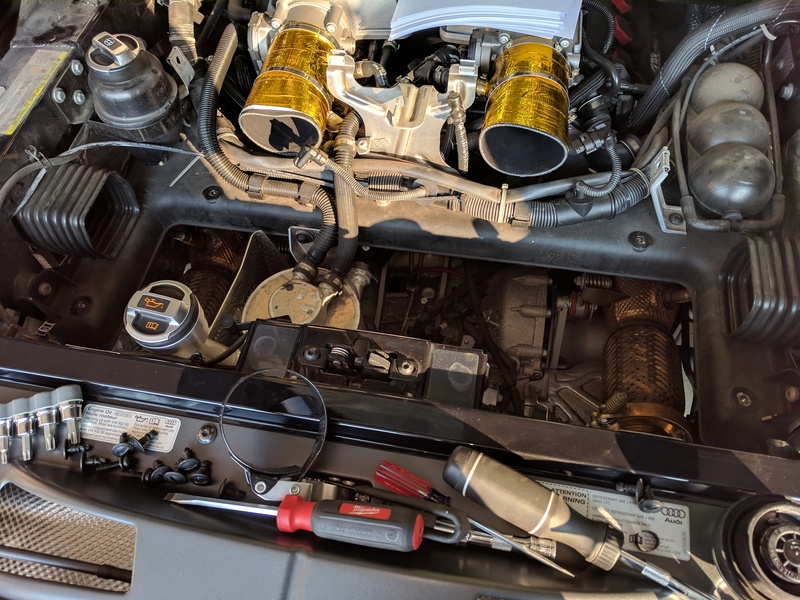 Since the bolt heads on the exhaust clamps were facing upwards, we couldn’t snake a socket into position, so out came the airbox and engine bay side covers to free up some room. Another 30 minutes and we were staring down at the exposed muffler. With all the engine beauty covers removed, you can really appreciate the engineering that went into developing the chassis. It’s genuinely a work of art. Out came the airbox and side engine bay covers because access to the exhaust clamps wouldn’t have been possible otherwise. Here you can see the muffler tubing is clamped onto the cat. The header collector is just a few inches away on the other end of the cat. The exhaust routing fairly short, and the muffler itself isn’t very big. This is the old Quicksilver setup. As per usual, FedEx had a delay, so the muffler wouldn’t arrive until the weekend was over. Not all was lost though. 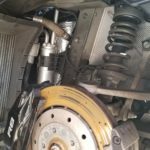 This was a perfect opportunity to drive around with an exposed drivetrain! The next day Kyle quickly slapped the taillights and muffler back on the car to drive around. Most important was the ziptied license plate. There were quite a few stares to say the least. Our excuse was improved transaxle cooling. 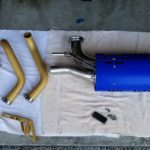 D-Day came, and the Larini exhaust finally showed up. 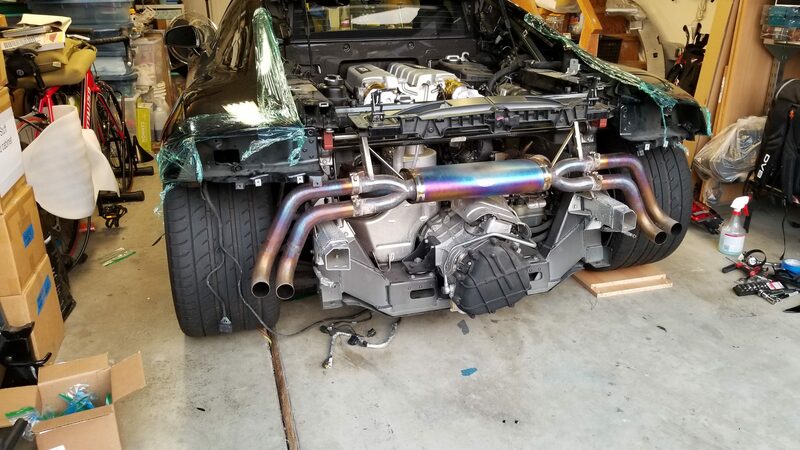 Unlike the the QuickSilver unit, the Larini exhaust has a color scheme found in a bag of neon gummy worms, and reads “R8 V10” on the muffler casing. Thankfully the heat shield covers everything once installed. We must not forget the exhaust valve has to be working in order to make the new exhaust worthwhile. 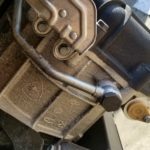 The valve itself is operated off vacuum like the stock muffler, but you have to tap into a power supply in order to get the remote controller to open and close the valve on command. 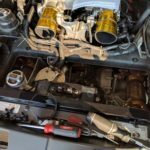 Crunched for time and fearful of ruining the costly supercar wiring harness, the valve was simply rigged like a stock R8 exhaust, meaning the valve stays closed until the upper RPM range, or set to sport mode. The Larini Club Sport, fresh out of the packaging. Installed into its new home. Packages from this company conveniently arrived during the exhaust install. 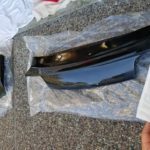 Since the spoiler comes bare, Kyle opted to add the Audi badges like the stock decklid. 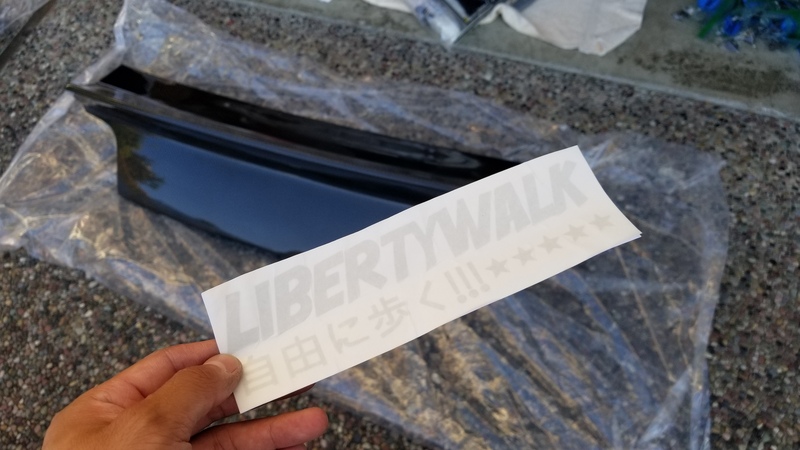 The Liberty Walk spoiler and rear diffuser conveniently showed up just as the exhaust job was going to be wrapped up, so reassembly took a little longer than anticipated. 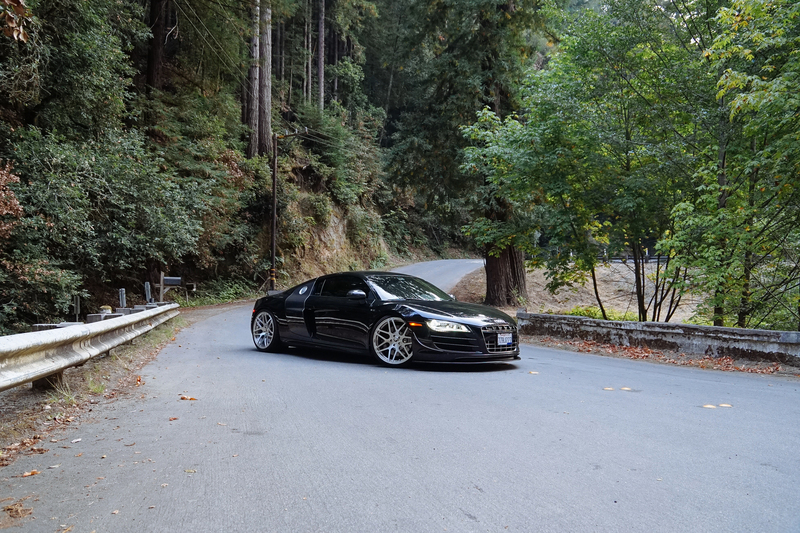 The new look is without a doubt aggressive, but adds some flavor to the sea of otherwise stock R8s. Did I say sea? It’s realistically a puddle by GM and Toyota production numbers. 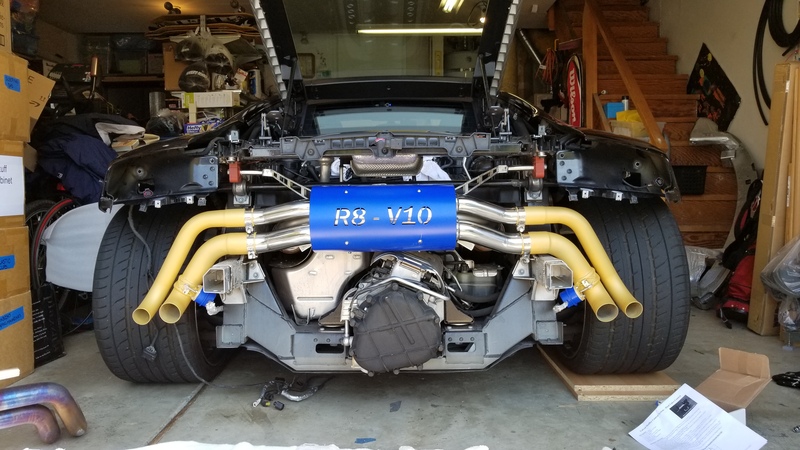 Larini’s Club Sport exhaust still alerts everyone that the R8 is on the move, however the sound quality is much more refined. Whereas the QuickSilver exhaust system was loud and brash, the Larini Clubsport seamlessly plays a remastered version of the V10 soundtrack. 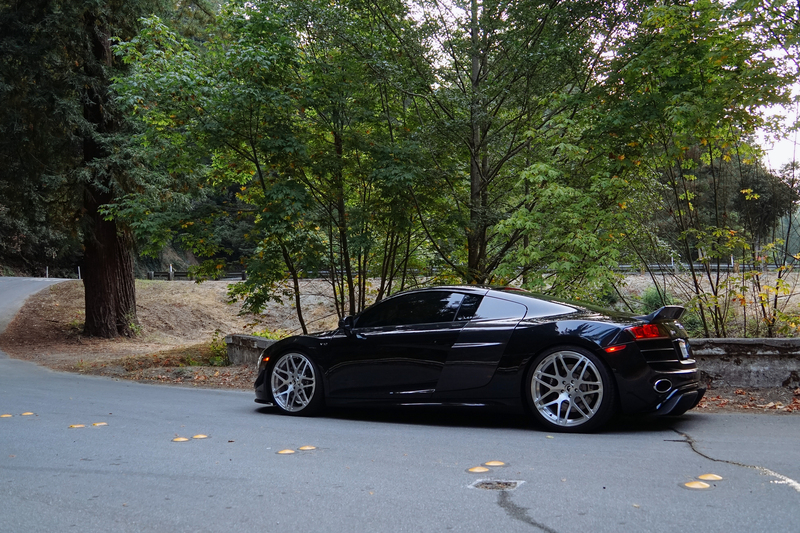 It hits all the right notes without being obnoxiously loud, including wide open throttle. 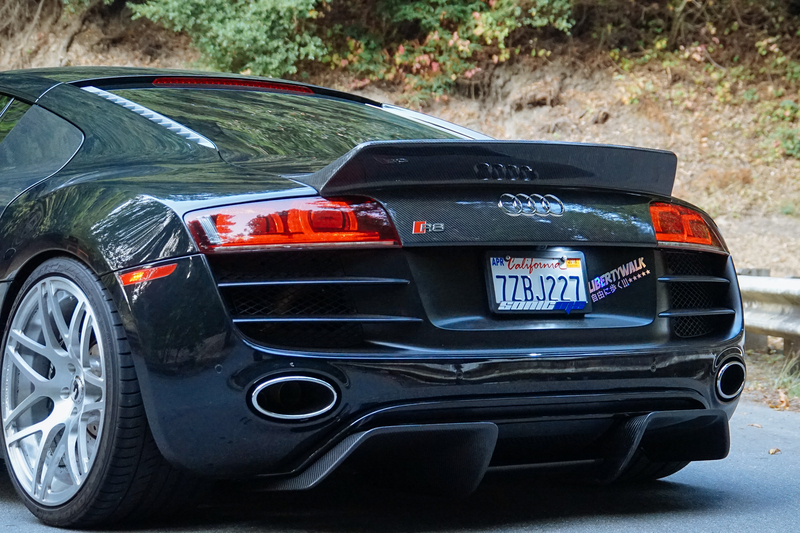 For the other 95% of driving spent at civil speeds, the R8 can cruise around town without making too much of a ruckus. A worthy feat in itself, especially when all prior attempts sounded like a 747 was making its final approach. Much to our surprise was the minimal drone at freeway speeds. With the engine sitting inches from the passenger compartment, the old exhaust made the cabin a tiresome place to sit on long drives. Understandably the R8 isn’t going to be luxo-barge quiet, but a high end car should retain good acoustics. 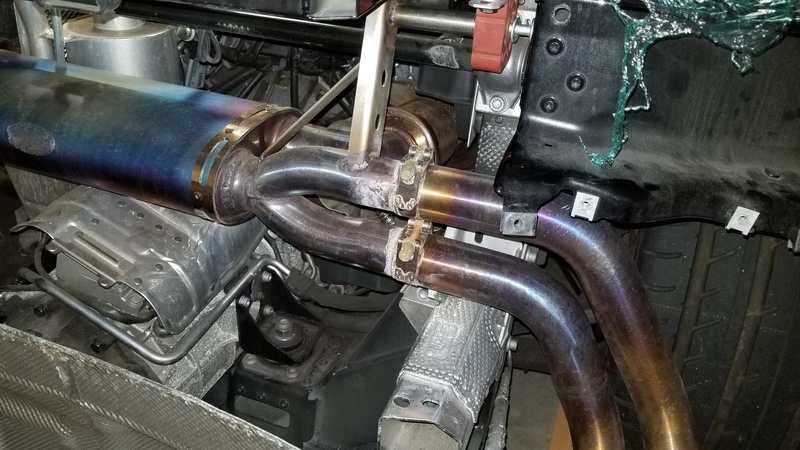 So Larini gets due credit for proving that sporty and refined aren’t mutually exclusive in an aftermarket exhaust. 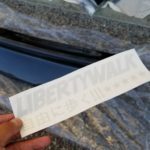 Liberty Walk spoiler and diffuser add aggressive flavor not commonly seen on an R8. Phantom Black taking a break. A throwback to when bumpers were optional! 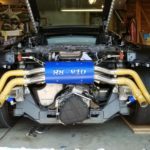 Power gains might be present, but in all honesty, the exhaust swap was done in the name of making the R8 less prone to setting off car alarms. At least we don’t have to worry about Huey Lewis telling us, “I’m afraid you’re just too darn loud.” Now the car can go back to being driven on a daily basis and keep a low profile. On second thought, who am I kidding? Thanks to Kyle for sharing pictures and video for this write-up.